Leftover sweet potatoes? Make a cake. 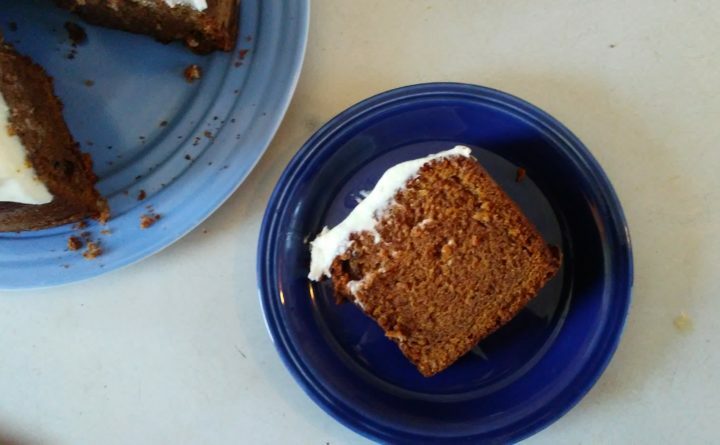 Another in the occasional Taste Buds series of “vegetables in funny places,” this sweet potato cake that Ruth Thurston in Machias sent along will remind you of carrot cakes, pumpkin cakes and squash cakes. So probably the moral of the story is if you have a hard yellow or orange vegetable you don’t know what to do with, make cake. Truth be told, you can use leftover cooked carrots, squash, pumpkin or sweet potatoes to make pancakes, muffins, waffles, cookies and certain kinds of biscuits, too. You get to feel virtuous about using up leftovers and not wasting, but you can’t kid yourself. This has vegetables in it, but the cake isn’t all that much better for you than your average plain white cake, even though it probably has a bit more nutritional value. What it surely has is much more flavor and character: spicy, moist and firm with a charming crusty exterior when fresh from the oven. I find I enjoy cake with oil as the main fat as this one has. It promotes a lovely texture. Feel free to increase the amount of spice to taste. I ended up with about a quarter cup less sweet potato that the recipe called for, and it came out fine, so there is some flexibility there. Don’t sweat it if your potato is a little smaller. Frost it or not. I used a favorite cream cheese frosting flavored with lemon juice, but plain confectioners’ sugar sprinkled over top would do just fine or serve it with whipped cream. The cake is large. Make it in a Bundt pan, or as I did, in a tube pan. Generously bedecked with frosting, it is a good dessert for a company supper. It will serve as many as eight or 10, depending on appetites. Without slathers of frosting, it is good as coffee cake or to tuck into lunchboxes. I expect you could bake it in a rectangular pan for less time then cut it into squares to serve. 1. Heat the oven to 350 degrees Fahrenheit. Oil and flour a tube or Bundt pan. 2. Sift together the flour, baking soda, baking powder, spices and salt, then set aside. 3. Beat together sugar, eggs, oil and sweet potato until very well blended. 4. Add the sifted dry ingredients and beat for a couple minutes. 5. Fold in the nuts, if using. 6. Pour into the baking pan and bake for 1 hour. Check to see if a tester inserted comes out clean and the cake has pulled from the edges of the pan. If necessary, bake for up to 10 minutes more. 7. Release from the pan and cool.